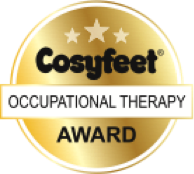 Entries are now invited for the Cosyfeet Occupational Therapy Award 2018. This £1000 award is open to qualified OTs or OT students planning to undertake voluntary work, a work placement or research, either in the UK or abroad. The winner’s application should demonstrate that their chosen project will develop their professional knowledge and skills while benefitting others. Palliative care specialist, Gillian Walker, won the award in 2017 to help fund a pioneering project at Northern Ireland Hospice. The project focused on providing sessions on falls awareness to Day Hospice patients and those who assist them. Cosyfeet specialises in making extra roomy footwear, socks and hosiery, designed to fit people with extra wide or swollen feet. As a company, they care passionately about falls prevention, and ensure that their range includes a selection of styles that provide excellent support to the foot as well as a secure, adjustable fit. Their goal is to help keep people independently mobile for as long as possible by providing good footwear to fit swollen and misshapen feet in comfort. If you would like to apply for the Cosyfeet Occupational Therapy Award, visit the Cosyfeet website for further information and to enter online before the closing date of April 20th, 2018. The winner will be requested to submit a report and photographs of their experience, and to be included in Cosyfeet publicity relating to the award. Source: Cosyfeet press release supplied. Tagged Cosyfeet, Cosyfeet Occupational Therapy Award, European MSc in Occupational Therapy, Occupational therapy, Occupational Therapy BSc, Occupational Therapy MSc, OT. Bookmark the permalink.